There are restaurants and restaurants in Bacolod but those who know will include in their itinerary, a meal in Manokan Country. "Manok" is Ilonggo for Chicken and Manokan Country is a row of 18 or so stalls that have one specialty, Chicken Inasal, Barbecued Chicken on a stick. A number of finicky relatives and friends will prefer Chicken House or Chicken Deli, which appear to be more civilized and more sanitary. But nothing beats Manokan inasal for flavor and juiciness. This is not surprising, considering how the chicken is almost always slaughtered the day it is served. Inasal vendor at the Bacolaudiat 2012. The favored parts - paa, tinae, isol are already out of stock. 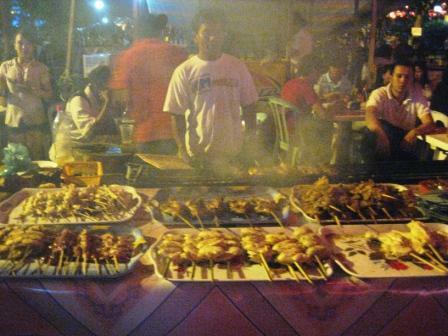 Even with the original inasal vendors transferred to the strip known as "Manokan Country," vendors like the one shown line up along streets near hospitals, bus and jeepney terminals, markets, and other places around Bacolod. 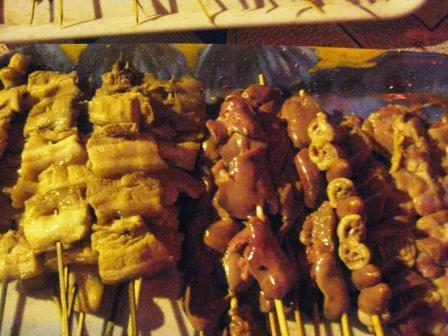 Skewered slices of pork belly, atay, chicken heart, and gizzards are all that remain of the chicherias (I think this is what the odds and ends of chicken are called). Tinae and isol usually disappear the fastest since they seem most delicious with beer. If these are not deliciously deadly enough, you can ask for yummy, super high-cholesterol golden oil rendered from chicken fat and cooked with atsuete seeds. All manokan chicken are generously brushed with this oil (which I can't imagine pouring on my rice as the rest of my family does.). Several stalls will also give fried garlic to add to the rice and oil. Beats fried rice any day. Arrive before the stall runs out of it and you can ask for free soup too, usually a steaming bowl of arroz caldo (rice soup with chicken broth) or lina-ga broth ( La-ga means to boil meat or vegetables until tender). Served with the inasal is patis (soy sauce, not fish sauce), calamansi, and sinamak (spicy vinegar), which Bacolodnon's mix to taste and use as a dip for the chicken. Metal utensils interfere with the taste of the inasal so you may not be given utensils until you ask for them. Give yourself a good handwash with soap and water so that you can do as the Manokan habitues do. You don't know what finger lickin good is until you've done it with Manokan chicken. You also haven't really seen and tasted Bacolod if you never go to Manokan to eat. As far as I know, Manokan is like a shrine that all balikbayans visit when they come home. Manokan chicken is also a favorite pasalubong to bring back to to family members and friends who were not able to make the trip. Replace the fancy green umbrellas with rusty Galvanized Iron sheets supported by 2" x 2" wooden posts and dividers of old streamers or plastic and you'll have a picture of the original manokan as we knew it in the 70's. The photo above was taken along Lacson St., during the 2012 Bacolaudiat. There was a time when the Manokan owners had make-shift stalls lining both sides of "Kilid State," a side street beside State Theater (Kilid means beside, thus the name). Enveloped by smoke from a hundred barbecue stands, there was a sense that entering "Kilid State" (Smith Street) from the plaza side was entering a no-man's land. Beer flowed freely till the wee hours of morning. People got drunk and became rowdy. In the hazy glow of so many incandescent lamps and smokey embers, who knew how many stabbings took place? And of course there was the big question of sanitation, there being no running water for washing dishes and utensils street-side. Before we knew how tourists love these rugged, al fresco, feel-like-a-native eating places, that is what most of the uninitated thought about our original Manokan Country. Kilid State happened to be a stone throw away from where I was taking up Architecture. Because it was so near and because my boyfriend (now my husband) lived part of his life on this street, I dared to go through the curtain of smoke and after the first time, kept returning. The eerie haze wasn't as bad as it looked from the outside although I am sure that had my parents known, they would have given me stern warning against going back. 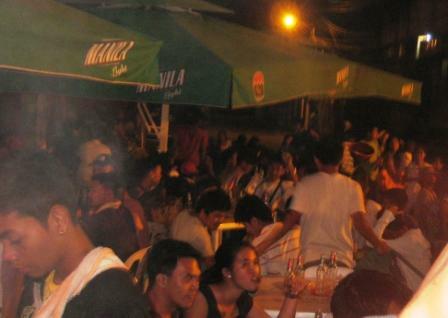 Eating street-side under the stars seems to be Bacolod's way of celebrating, as this scene during the Bacalaudiat shows. 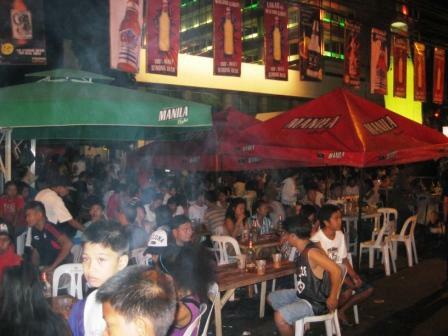 I think the old Manokan was so irresistible because there was always a sense of fiesta while there. In the late 70's, when a paper had to be written about areas in the city that could be developed as tourist spots, I was ghostwriter for an essay on the tourism potential of "Kilid State." It was a place the well heeled were not likely to venture into but I saw tourists there, visitors who wanted to experience a Bacolod that wasn't like every other city in the world. Walking along Lacson Street at the height of the Bacolaudiat yesterday (also recalling scenes of the annual Masskara festival), the happy diners sitting around street-side tables with their beers and chicken inasal brought back some of the magic of the old "Kilid State" as we knew it. Perhaps that is what the old Manokan was all about, the experience of fiesta on-call. Architect Joe Dureza, our teacher who later became part of the City's tourism development council, saw the magic that I described. When "Kilid State" had to be cleared, the stall owners were transferred to more permanent quarters at the reclamation area. This is how Manokan Country came to be. With SM City a short distance away, Manokan Country is now a standard in the tourism and restaurant map of the city. There is no airconditioning here, no fancy interiors. No one dresses up to go to Manokan and most people eat with their hands. As with "Kilid State," the common people eat here, families, barkadas (groups of friends), employees after work. I've seen many a rich friend bring foreign visitors to Manokan. I do too although my siblings prefer Chicken House. My husband goes to Manokan for the tinae and he likes this best at "Lion's Park." I'm more of a health freak so i stay away from all the high-uric, high cholesterol temptations that Manokan offers. I like Lion's Park for visitors beecause aside from the chicken, the restaurant has crab fu-yong, sisig (a delightfully spicy concoction of pork ears and masskara - face), sinugba na baboy or sinugba na bangus (grilled pork or grilled milkfish), kansi (beef bone marrow with jackfruit in a sour broth), and other choices. I have a daughter who loves the chicken at Umbao's (owned by my classmate so I don't mind advertising her place). Aida's is owned by the family of another classmate. There are different Nena's something barbecue stalls and there are Nena's branches in other parts of Bacolod. Seems to speak of the success of Nena's. Another stall worth mentioning is owned by a popular local artist and is the favorite haunt of LCC Arfien Alumni (Architecture and Fine Arts alumni under Dean Perfecto Marzona). This artists' haven is decorated with original paintings on wood or canvas, sculpture, and other art pieces, all for sale at near give-away prices. Across the street from Manokan is Andok's, also specializing in chicken. In SM, you will find Mang-Inasal, admittedly the biggest chicken inasal restaurant chain in the country.. How does chicken in these other restaurants compare with chicken in Manokan? Shall I say that when I'm in Boracay or Baguio or some other place where I'm looking for a cheap lunch, I might go to Andok's or Mang-Inasal but that is only because Manokan Country is not an option? If there is anything that Bacolod is, it is Manokan Country. Here, chiicken inasal is chicken like nowhere else in the world.